'The Woman in Cabin 10'. Slowly and surely I am getting through "Motown - The Sound of Young America". Last edited by lakeside; 11-16-2017 at 11:00 PM. The kennedy curse,BY EDWARD KLEIN. Wow. My partner would love that. My current one: UNDERGROUND AIRLINES by Ben H. Winters. A conversation with Scott Saul, author of the new biography, "Becoming Richard Pryor." Richard Pryor's widow Jennifer Lee Pryor stops by Alison Rosen Is Your New Best Friend to talk about how she and Richard met, what she loved about him, what she misses about him, codependence, her relationship with his kids, drugs and threesomes, marrying, divorcing and marrying him again, her involvement in the upcoming biopic, executive producing and appearing in Richard Pryor: Omit the Logic, domestic violence, Richard's suicide attempt, other women, the N-word, Bill Cosby, Mike Epps and so much more. We also did a round of Just Me Or Everyone. Fantastic! Thanks, Dylan, and welcome aboard! I'm still trying to get my hands on "Fire And Fury". I'm told everywhere I go that it's sold out, backordered, and that as soon as anyone gets any copies, they're all sold within minutes. I don't want the Kindle version. I thought I wanted to read it as well until I heard from liberal, moderate AND conservative voices that it's riddled with typos and inaccuracies. Let us know if and when you get your hands on one. Every stinkin' day, the shithole proves that everything in the book describes him to a "T", with the "i"s dotted! From everything i've heard from progressives and moderates, and psychologists, it's quite accurate. The only people who don't like it and say it's fake news is shithole's supporters. Last edited by sansradio; 03-04-2018 at 12:26 AM. Thank you sansradio...I'll definitely check that one out. Indeed, right up my alley! Anonymous....Christine Benedict....local author. I even know where that house is! Just finished 'Kill Creek'. This one ticked all the boxes in the haunted house genre. Correction: This is a history of Lena's paternal grandmother's family. 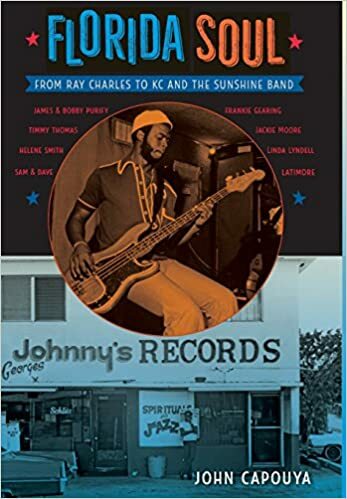 Florida Soul: From Ray Charles to KC and the Sunshine Band. Highly recommended ! I received this as a gift about two weeks after he died and am finally going for it. It's a 500+ page exploration of the work. No idle gossip here, just a solid, exhaustive artistic appraisal. Loving it. The Man Booker Prize-winning novel loosely based on the assassination attempt on Bob Marley in 1976--16 pages in and I'm utterly spellbound. The legs are the last to go-diahann carroll. I loved it! Even better than her first book. WHITE MUSIC: THE BARRY WHITE STORY by Tom Rubython. I saw this in Barnes and Noble; my partner and I guffawed all the way home about the clever title. Give us a review when you finish! I just finished reading The Lost Supreme (I cried several times, my baby Flo deserved SO MUCH better from so many people and from life itself) and Red Azealia by Anchee Min. I am also reading The Last Empress (about the empress dowager Cixi), a book about Anne Boelyn and another about how to pick up weed and say really horrible things about people's mothers in Mandarin. It's very useful. LOL! Welcome to The Forum! Yes, The Lost Supreme is certainly a tearjerker. How did so many bad people hurt her? Why did they get away with it? Why would they e even want to hurt someone so sweet and hurt her so badly? I hope the pos who raped her is rotting in hell. About to buy The Warren Commission report. Very cool. This book is a cause for celebration! Give us a review when you're done, please! Set in Redford High School in the early-mid 70's. It's a good read. I just finished[the hippest trip in america]which is of course the history of soul train by nelson george.